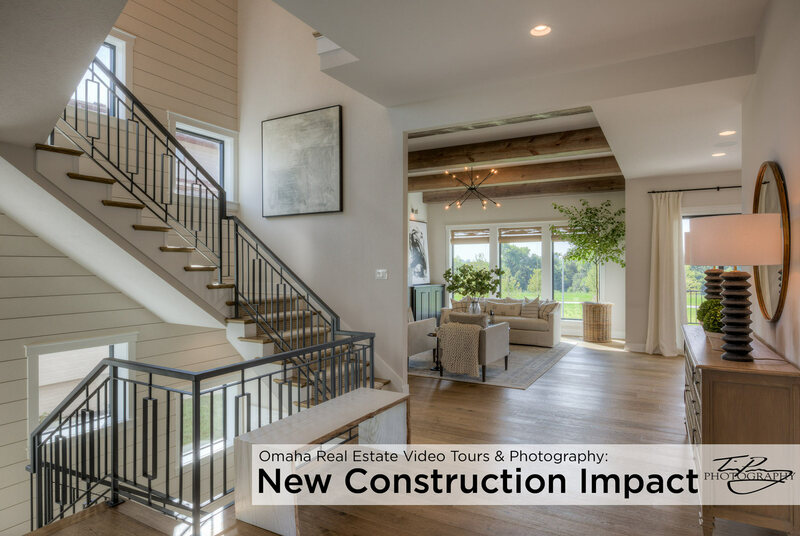 I get to work with some great businesses doing what I do, and what I’ve noticed lately is the impact that Omaha real estate video tours and photography have on new construction. There are so many great reasons why having a video tour of new construction can really help Omaha custom home builders better sell their base floor models. Real estate photography is still important in selling a home, but a real estate video tour adds almost a 3D dimension to the walk-through. People can gather the feel and layout of a home by taking a video tour much easier than looking at a 2D blueprint or even photography. Potential home buyers and home builders can also see examples of the different finishes possible for each room of the home by showing photos and videos. When a builder holds an open house on a new construction, a real estate video tour can be an amazing sales tool, too! For example, home builders can play videos of all their models from their YouTube channel at a model home. Having all their floor plan offerings available in video tours in a YouTube playlist allows home builders to show other homes on a big TV…without the visitors even having to leave the current model home! Real estate video tours also provide excellent SEO (search engine optimization) opportunities that can help a home builder move up in search! YouTube offers amazing SEO opportunities, allowing them to embed the video tours on their websites, with all of the keywords and hashtags assisting them in search. My clients at GreenSlate Management use our real estate video tours on their new apartment listings, too! You can check out another video walk-through here. My clients at Landmark Performance Homes have often commented on the obscenely high percentage of leads coming off of their website inquiries where they have embedded many of their Omaha real estate video tours. They have a considerable amount of new construction closings before the end of 2018 that they will need photos and/or videos of…which goes to show how vital this type of visual representation of their homes aide in their sales funnel. You can also see their Bennington Home Tour of the Brookfield Ranch Plan here. Call today to discuss what our Omaha real estate video tours and photography can do to sell more listings and new construction!